It is definitely time for another empties post and this one is very much skincare focused as I’ve been getting my body polished for my forthcoming holiday. This would have been up sooner but the Decleor Cleansing Milk seemed to be never ending. Always the tortoise and never the hare. A lot of these products are firm favourites of mine; I’ve used the Decelor cleanser and toner for years and years. The two scrubs I’ve been using up since I received them… in Christmas 2010! You might remember my post on the big pink box I got them in if you’ve been reading my blog a while… but yes, 2010. Since I’ve been operating a one in one out policy since January 2011 and really being careful with the beauty purchases I make in a bid to use up the products I already have, I’m hoping you can realise just how many similar products I had to use up before I made a start on these! This has to be my most favourite Soap and Glory product ever. Not only is it a great gritty scrub but it smells amazing too, like porridge oats with maple syrup, mmmm. I could literally sit and sniff this all day. I wish there were more Soap and Glory products with this scent as I’m not a big fan of the scents of the other products. I use this sugar body scrub twice a week in the bath to keep my skin smooth and free from any rough bits and it does a really good job. It isn’t as oily as some of the other Soap and Glory scrubs but it does still have oils in it so I wouldn’t recommend using it before false tanning as it will effect the development of the tan. The only time I use this when I’ve been wearing false tan is about a week later when I want to get rid of the rest of the tan on my skin as the oils in this product help to break up the tan. I would not hesitate to buy this again, I adore it. This week I finally finished up using another Soap and Glory scrub. Over the last seven months I’ve been alternating between this one and The Breakfast Scrub and I have to say that The Breakfast Scrub is my favourite. Whilst this salt scrub is really gritty and works very well at smoothing out my skin, The Breakfast Scrub is just in another league, mainly because of it’s scent. Flake Away is just too oily for me. It is a brilliant exfoliater but it leaves my bath tub in such a state after I’ve used it, very oily, slippy and scarmy which I just cannot be doing with; after a relaxing bath the last thing I want to be doing is fannying on cleaning it afterwards. I’ll not be repurchasing this one. I love this conditioner because it’s really intense and does a great job at really nourishing my hair. I tend to use it after I’ve just had my highlights and low lights done. After shampooing, I put loads in my hair and just sit with it on for about 10-15 minutes before washing it out and my hair instantly feels so soft and healthy. It has a light pink tone to it and smells like peppermint. When I first started using it, it reminded me of a foot cream because of this! I would definitely repurchase this conditioner. Well my love affair with these products is finally over. I’ve repurchased both of these countless times over the last five years but now is the time to move onto other products. Decleor, it’s not you, it’s me and I wanna break up. These are the last two Decleor Cleansing Milk and Tonifying Lotion bottles that I have and whilst I do think that they are fantastic products, particularly if you have sensitive skin, I want to try out other products now that I’ve used them all up and with that in mind, I’ll probably not repurchase them in the future. I do have plenty of good things to say about them as they have been my go to products for years now and you can read my full review of both of these products here. I’ve replaced them with this Clarins cleanser and toner which have now become my staple skincare products. I’m trying out other cleansers and toners but, like with the Decleor, these have become the two products I always have in stock in my skincare bag. 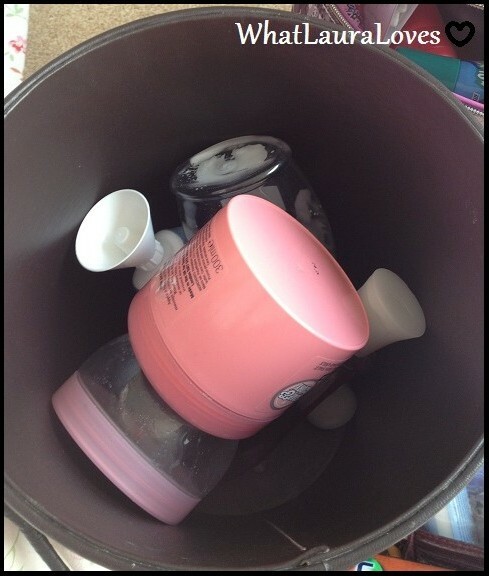 Throwing away empties is just so satisfying isn’t it?! What products have you used up recently? 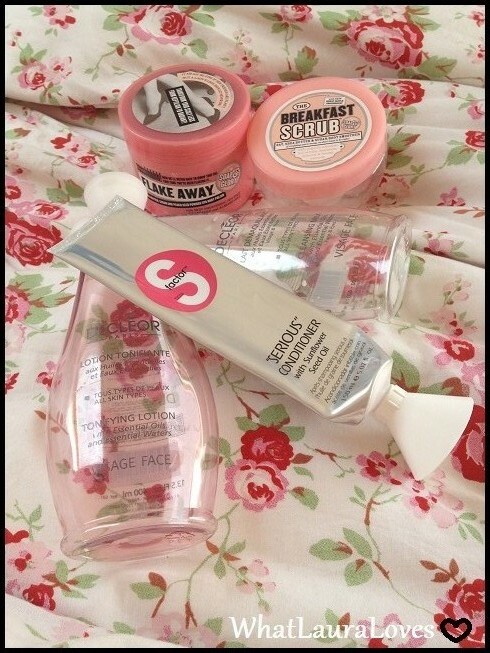 Which Soap and Glory scrub is your favourite? Great post but I don't see the point in giving up Decleor when you know it works for you. Thanks Hun. I'm not giving up Decleor as a brand all together, just these products that I've used day in day out for years. Yes they work for but nothing ground breaking and there's so many other products out there that I'd love to try… Life would be pretty boring if I stuck to the same brand forever! so satisfying dumping a load of empties!